The secret is out. Each one of us has an idiot lurking inside just waiting to be unleashed. Even a genius is mediocre at something. The books you read and the people you meet are powerful tools for increasing your understanding of just about anything. One of the most frequent inquiries I get at conferences and keynotes is what books I read and recommend. From creating competitive barriers in business to analysis of the pigeon’s impact on humanity, my personal library is a testament to one thing: I have more questions than answers. 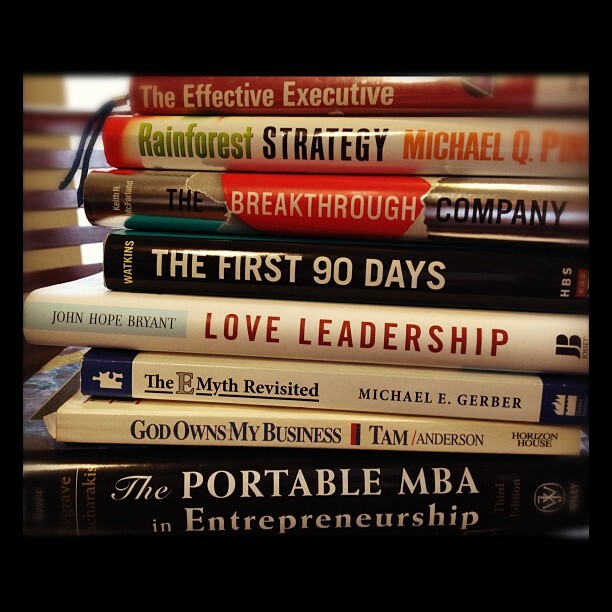 That said, I’ve compiled a list of my 10 most-recommended books on business and leadership. Each of these books has significantly influenced me at various times in my life and shaped positive outcomes for many of my peers. These must-read titles are ranked roughly in order of impact. So start at the top and check each book out for yourself. This one’s easy. Peter’s books are staples in business schools across the country and this one gives clear parameters for successfully navigating organizations by managing 5 realities: your time, contributions, personal strengths, priorities and decision-making. For most, it serves as a compass of confirmation and courage when managing change. The realization that there are always limited resources means rethinking where we spend our time and how best to achieve world-class results. This book isn’t tucked away in my office library, it’s in the living room. Read often. Birds were born to fly. Fish were formed to swim. I was made to _______. The word you put in that blank guides your steps, defines success and influences how you lead others. Munroe’s message is fairly simple: to understand the creation you must know why it was created. I had the opportunity to meet him in Austin shortly after launching my own start-up 4 years ago. His tips, or better yet, truths are universal and foundational. This book is 20% information and 80% inspiration, making it a great weapon to have in your mental and emotional arsenal. Not your typical management book, Rainforest Strategy explores how observations from nature’s most fascinating ecosystem can actually be applied to business and industry. Pink spent several months researching the scarcity of resources in rainforests and how the plant life transformed adversity into abundance. For instance, tropical rainforests produce 50% of their own rain by using the process of transpiration, where water evaporating from leaves is pushed right back into the ecosystem’s air. In business terms, Pink asserts that productive businesses should never rely on outside sources for more than half of their information. He suggests tactics for gathering, evaluating, disseminating and ultimately leveraging a corporation’s best thinking from the inside out. My first entrepreneurial seizure, as Gerber calls it, occurred in the winter of 2006. I was running the specialty retail marketing division for Liz Claiborne and, after trading ambitious emails with a good friend, was stricken with the overwhelming urge to spread my wings and soar. One year later I was scouting office space, hiring graphic designers, pitching new business and running a brand development firm in Dallas. E-Myth is a non-negotiable must-read for anyone who has even a tingle of passion for starting their own business. He dives deep into the fatal assumptions that plague entrepreneurs before they ever start and gives practical advice for building a business model that works without you, not because of you. For a 5-minute primer on the 8 things I’ve learned from running my own business, check out my post E-Attitudes: So You Want To Be An Entrepreneur? New opportunities bring new challenges. It’s estimated that 40 – 50% of outside hires within a new organization fail to achieve the desired results, costing millions of dollars, wasted resources and impeding both personal and professional growth. The First 90 Days provides a strategically sound road map for beginning a new position, accelerating your learning, assessing needed strategies, securing early wins, building a formal and informal team and defining success. In every new role, your goal is to produce results and demonstrate measurable value while reaching a tipping point where the company needs you more than you need the position. These days such perceived and actual value is more critical than ever. For an overview of my approach to starting a new job and building the social media practice at RadioShack, read 365 Days of Social Media: How I Learned by Shutting My Mouth. My copy of Groundswell isn’t at home, it’s at work. Groundswell was the first book that adequately captured the challenges and strategies faced when activating social media as a business tool, not simply a marketing tactic. When I accepted my current position at RadioShack, I was left with one lonely mandate: read this book. Two years later I was standing on stage accepting a Groundswell award from Josh Bernoff in recognition of our RadioShack interactive marketing campaign that yielded energized consumers and business profits. The potency of this title isn’t solely reserved for digital marketing execs, it also provides a framework for engaging communities and building internal consensus. Since the book’s release, Charlene started the Altimeter Group, a social business consultancy in San Mateo, CA who produce some of the brightest thinking in the industry. Josh’s follow-up book, Empowered, is also a must-read and I’ve personally claimed him as my own book-writing coach. When Stanley Tam founded U.S. 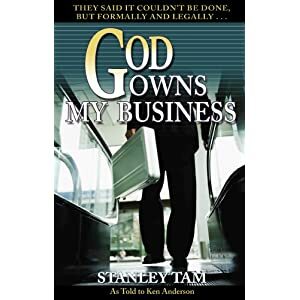 Plastic Corporation more than 60 years ago, he had a simple yet profound desire: to legally make God the majority shareholder of his business. As you can imagine, the story that ensued is quite a tale as he ultimately discovers a way to donate extraordinarily generous portions of annual profits to help others. Even if you look beyond his ambitious attempt at divine accounting, the core principle of Tam’s message is quite plain. Things happen when you know who your Senior Partner is and acknowledge that He’s equipped you with all you need to get the job done. Indeed, hope is not a business strategy but using your physical, mental and spiritual resources certainly is. There aren’t very many books or stories that reconcile faith and business so this one is a great reference. Iron sharpens iron. Half of the articles published on the Harvard Business Review website mention at least one of these companies: IBM, GE, Dell, Wal-Mart and Southwest Airlines. Yet, every large business started as a small one and there seems to be a dearth of data on how the little guy gets bigger, successfully. Keith was challenged and encouraged by Peter Drucker and Jim Collins to attempt to identify the core drivers that empower a start-up to mature into a material growth company. After a 5 year research program that included 7,000 companies, The Breakthrough Company presents these findings in an interesting read. By addressing such issues as exit strategies for founders, building a blueprint for company culture and enhancing capabilities, Keith gives small and medium business owners several insights worth rehearsing. Best of all, he provides granular snapshots inside breakthrough companies, including Chico’s, Fastenal, Intuit, Polaris, SAS and The Staubach Company. Talk about a cheat sheet. 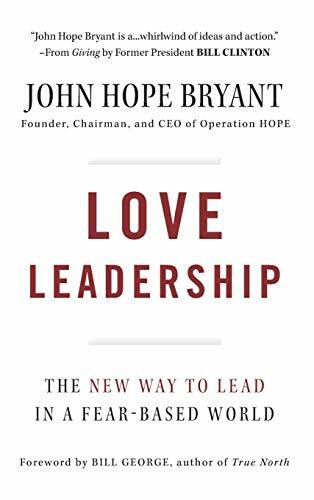 Awesomely enough, I discovered John Hope Bryant via Twitter. The guy provides daily doses of global facts, reality checks and introspective one-liners that require a mental pause. His book brings together two of our country’s favorite pastimes, loving and leading, into a biographical journey through his childhood, the L.A. riots and Presidential favor. He argues that doing what’s profitable and doing what’s right doesn’t involve compromising one for the other. Honestly, I respect his perspective for the obvious reasons – he’s an African American male pioneering change – and also for his transparency in sharing his flaws and fears. This vulnerability, he asserts, can be our greatest source of power. I’m always looking for an excuse to place an Amazon order so drop me a comment below with your must-read books or any I missed. What authors have changed your POV?